Joharo at home: Anyone for tea? Some days are just perfect aren't they? Today was just one of those days. I spent a happy morning pottering around the house, tidying up (shoving things in cupboards.. they are now called friendly cupboards... you know the sort.... open the door and everything falls out to greet you!!) hoovering, making a cake, some biscuits and some bread (ready for scrumptious bacon sarnies) and then flicking the switch on the kettle in anticipation of the arrival of a very dear friend of mine. We have known each other since we were 12.. thats... mmmmm... quite a few years ago now!! She drove all the way from Mullion to come and spend the day with me so that we could catch up on all the news and tittle tattle. 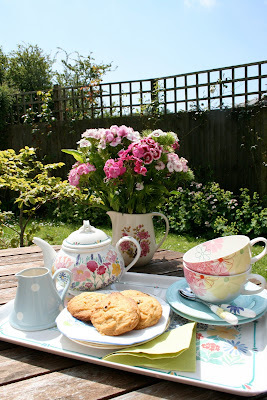 We sat in the garden for morning tea, munched on choc chip biscuits ... really easy to make and sooo moooooreish..... enjoyed the sun and chatted like two 12 year old school girls, just delightful. Isn't it great having friends that you have known for so many years that you can just pick up where you left off whether it's been 10 days or 10 years? By the way, the kettles always on... pop by for a cuppa and cake anytime, I'd love to have your company. Can I come and join the fun and have tea? I have a friend like yours, we meet a few times a year and catch up from where we left off. Cupa coffee, no sugar and cake please!! ps - i have some of those cupboards too! I must get my act into gear and pop over for my own cuppa with you. I was thinking of you on Sunday because I came across a certain knitting pattern of a certain special little girl's cardigan! Do you remember how the that very first visit to your home re-awakened the need to create and to change our neglected home. I'll never forget seeing you with a 2 year old Harriet on your hip..wearing that fabulous cardigan! Oh such memories. The dining room carpet was lifted not long after! !